Blockheads, lasagna, tigers, oh my! Comic strips accompanied us throughout our childhood, evolving along with their readers and even making the switch from newspapers to the world of the internet as the years passed by. Here are six such comic strips and their individual evolution from the very first strip to the final updated sketches. Garfield was launched on June 19, 1978. The lazy, gluttonous, obese tom cat has noticeably changed as Jim Davis widened his character’s eyes and adopted the cartooning style we see nowadays. One factor that has not changed: the uncanny resemblance between pet and owner. This beloved comic began on September 20, 1969 as a simple black-and-white strip in Sunday newspapers. Peanuts narrates the daily life events of Charlie Brown, a young boy with a pessimistic disposition and alarmingly round head, his fantastically imaginative beagle named Snoopy, and the rest of the gang. 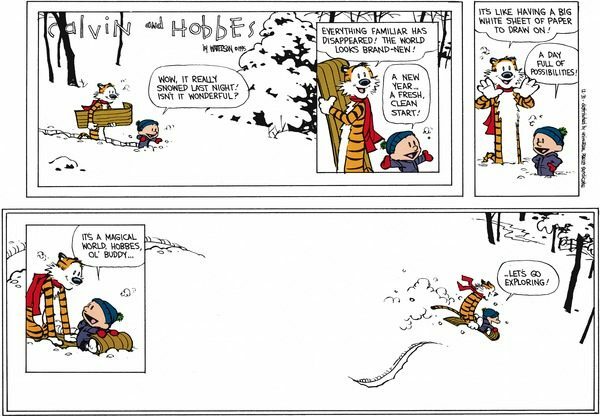 Introduced on November 18, 1985, Calvin and Hobbes beautifully merges adult cynicism with a child’s imagination as we meet six year-old Calvin and his best friend: a sardonic, anthropomorphic tiger named Hobbes. Their ridiculous adventures together are bound to improve a gloomy day. If you enjoy talking ducks with a hilarious, narcissistic personality, a geeky 10 year-old with oversized glasses, and a coffee-obsessed grandfather, this is the comic for you. Sheldon starts off with 10 year-old Sheldon, who became a billionaire overnight. Friendly for all ages, this webcomic offers hilarity as well as heart-warming moments. This comic strip brings to light the strangely familiar anecdotes one may collect after spending years working in a cubicle. It is almost like watching a the slightly different version of The Office, with all the quirky characters and random shenanigans. Ah, the eternal struggle between teenage-and-parent interactions. Zits is relatable for both groups of people. With its witty dialogue and expressive characters, this comic follows the life of a 16 year-old high schooler by the name of Jeremy Duncan. Which comic strip did you look forward to every week?